The Spinner Loose Ring is formed of two circular rings that sit on top of the tongue. They move with the tongue to prevent the horse from putting his tongue over the bit or rolling his tongue up behind the bit. 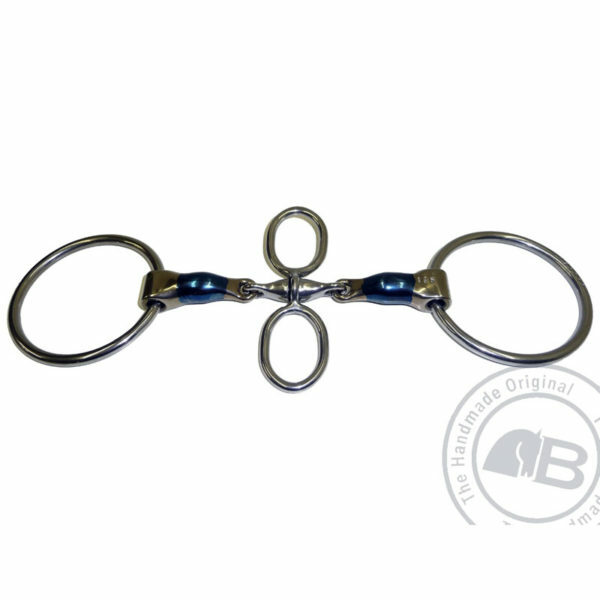 Together with the blue sweet iron mouthpiece, which oxidises in the horse’s mouth to create a warm, sweet taste, this bit from Bombers Bits encourages mouthing, salivation and acceptance of the bit. It is designed to make the horse more relaxed in his mouth and encourages him to go forward into the bridle, rather than ducking behind the bit. The loose rings make this bit mobile in the horse’s mouth, further promoting acceptance and gentle mouthing. They also allow for an immediate release of pressure when the rein aids are relaxed. Hence, rewarding a correct response quickly.